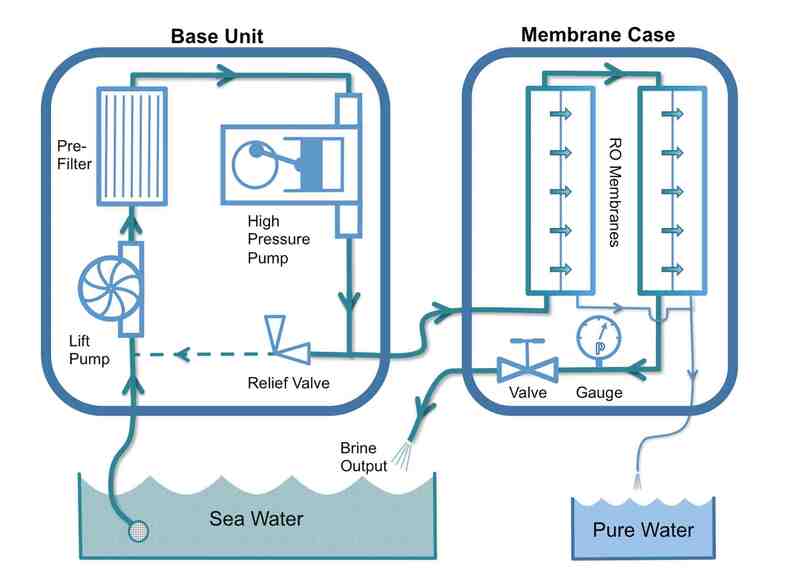 Desalination sounds complicated, but it’s really quite simple in practice. The Rainman desalination system works by reverse osmosis. High pressure is used to force water through a membrane, leaving pure water on one side, and salty water on the other. It’s a bit like forcing water through a filter, except with reverse osmosis the pure water is forced through the membrane on a molecular level. Sea water reverse osmosis requires a lot of pressure- about 800 PSI or 55 Bar. That’s about the pressure you’d find half a kilometer beneath the sea. In the Rainman desalinator, a Honda engine or electric motor drives a Jabsco impeller pump and a General Pump high-pressure plunger pump. If the setup reminds you of a high-powered pressure washer, it’s because it is similar. Honda engines and General Pump Piston Pumps are the workhorses of the commercial pressure washing industry. The impeller pump lifts the seawater, and the high pressure pump raises the pressure to around 800 PSI. The high-pressure seawater is fed into a fiberglass pressure vessel that contains a Dow Filmtec reverse osmosis membrane. The water flows past the outside of the membrane, which resembles a hollow plastic tube. In the Rainman desalination system, the membrane is built with layer upon layer of thin films of plastic, which allow fresh water to permeate through to the inside of the tube. Only a fraction of the high-pressure seawater is converted to pure drinking water. About 85 percent simply washes by the membrane and is flushed out the other end. The constant flowing of water past the membrane cleans it, preventing the membrane from clogging up. 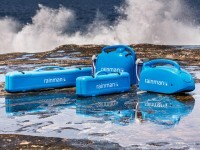 Rainman desalination systems are the first truly portable marine watermakers. We’ve taken all of the technical complexity and put it into an easy to carry and use fresh water watermaker. Portability makes the Rainman watermaker perfect for boaters and adventurers of all types. Should I Keep My Rainman Watermaker Portable or Install it?